MK AGMs have combined deep cycle and starting battery properties that outperform the competition. MK batteries are built by East Penn Manufacturing, the same company that built the original Prevailer gel battery that set the standard for the battery industry. If you compare the features, performance and cost of MK AGM batteries to those of other manufacturers, you'll quickly understand why MK AGMs have become the number one choice. Fastest charging, incredibly low self discharge, no water level checks, no spillage, no hydrometer usage, no burn holes in your jeans, no corrosion, no gassing, no battery box needed, they can be mounted on their side... AND THE LIST GOES ON !!! WHY BUY AGM BATTERIES FROM HAMILTON FERRIS CO? 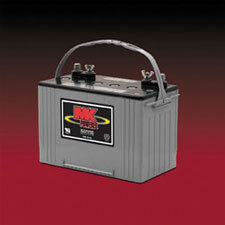 - We offer MK AGM Batteries - The best AGM batteries built. - Our prices are great - Check & Compare. - Free local spent battery disposal.